You know how crucial it is to wear sunblock every day and this includes the fall and winter season as well. With physical sunscreen and chemical sunscreen, how do you know which one is the best? Which sunscreen is less likely to produce breakouts or irritate those with sensitive skin issues? Which one will give your skin the best shielding from the sun? There’s a big controversy over which type is the best. So let’s go over the main differences so you can make a proper choice in the physical vs. chemical sunscreen dilemma. Physical sunscreen, unlike chemical sunscreen, contains mineral elements, such as titanium dioxide or zinc oxide, which chiefly function by laying on top of the skin to divert harmful UVA rays further away from the skin. Shields from the sun instantly when applied. Not as probable to produce irritation on the skin, making it the prime choice for sensitive skin users. More effective for those who have rosacea or redness in their skin because it diverts the heat and energy coming from the sun absent from the skin. Can come off, sweat off and rinse off, which means you have to frequently reapply when outdoors. This can become annoying and bothersome for many people. Can produce a constant film, which means more sweating during exercise or heightened activity and this causes it to come off faster. Won’t be as effective if it isn’t applied properly because UV light can go through the sunscreen molecules. It is usually thinner and spreads easier on the skin, making it better for everyday use. The formula is simple to add on to additional treatment ingredients too, such as peptides and enzymes, which provide extra skin enhancements. It requires 10 minutes after application to dry and maintain a protective layer over the skin. Some people may get annoyed with having to wait for it to dry. The chemical elements oxybenzone and oxtinoxate have been restricted in Hawaii for having a risk of corrupting coral reef when worn while swimming in the ocean. (This goes for water-resistant beach sunscreens solely and not daily use sunscreens or makeup with sunscreen.) Here’s a suggestion, when at the beach, wear long-sleeve UV protecting swimwear to eliminate sunscreen getting into ocean waters. 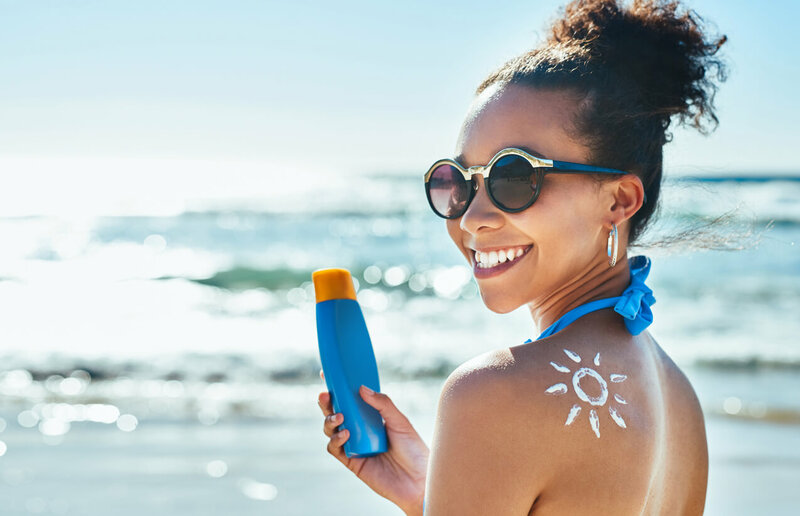 Chemical sunscreen has natural (carbon-based) elements, such as oxybenzone, octinoxate, octisalate and avobenzone that manifest a chemical reaction and function by changing UV rays into heat, then revealing that heat from the skin. So, which one is the better sunscreen? The answer is physical sunscreen. Physical sunscreens include active mineral ingredients, such as titanium dioxide or zzinc oxide, which function by sitting on top of the skin to deflect harmful UV rays away from the skin. They are usually referred to as physical blockers. This is because, the chemical sunscreen agents absorbed into the skin surface could prevent sunburns, as they generally do it by absorbing UV rays in sunlight and dispersing the energy/heat into the surrounding tissue. This, in turn, can encourage melanin production (as the skin’s heat sensors signal that it is being attacked). Evidently, in essence, the process of absorbing the rays can still trigger hyperpigmentation.